Here at the Simple Suburban Homestead we like to keep things simple! This coop and all of the additions (auto water/feeder/cleanout) are designed for the suburban family with limited time. The coop can comfortably house up to eight laying hens to provide your family with plenty of fresh eggs daily. 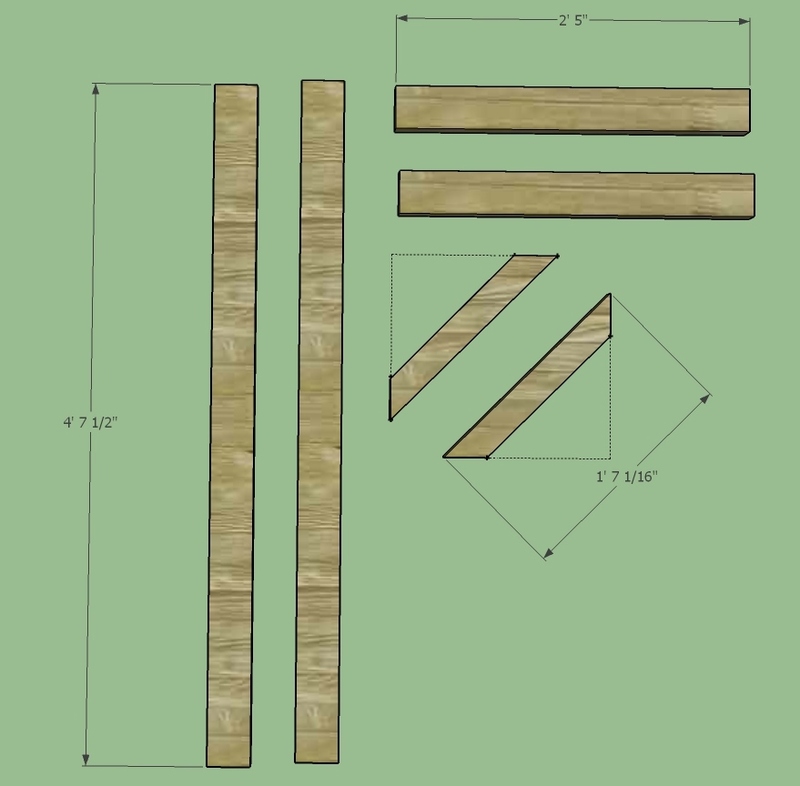 The design takes into account standard lumber measurements which reduces waste and cost. The easy cleanout tray makes cleaning the coop as simple as possible with one person cleanups taking under 20 minutes. For the full video series on building the coop please check out our YouTube Playlist here. 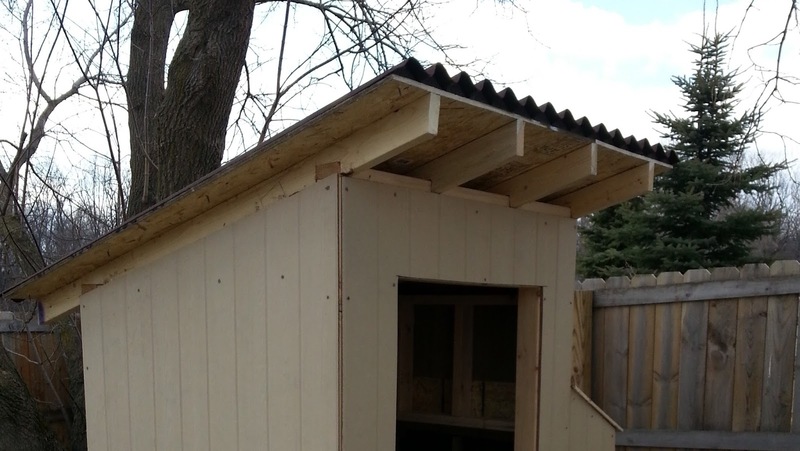 We hope that this coop brings your family years of quality enjoyment, fresh eggs, and healthy chickens. The first step is to level an area greater than 4’ X4’ to accommodate the base of the main coop. 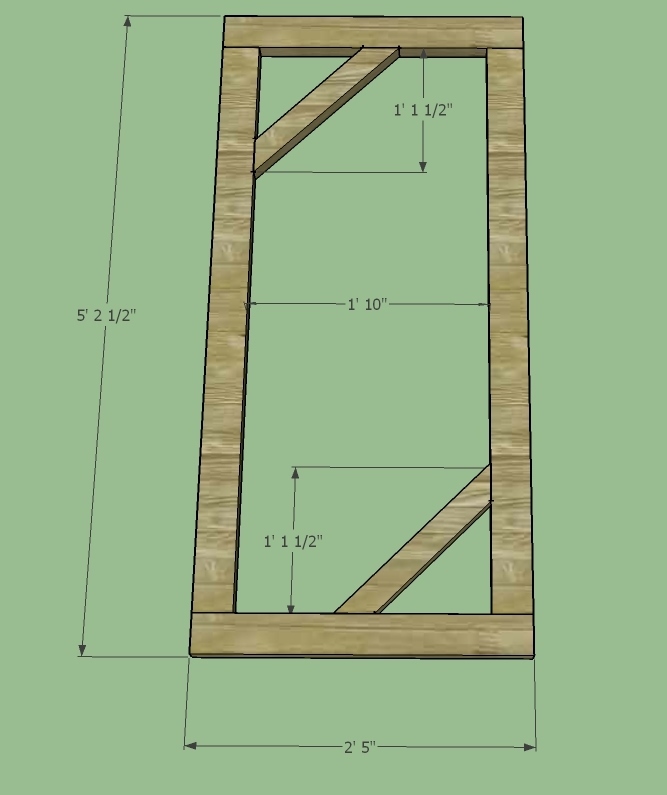 The base consists of 4 posts with a 2X4 frame to make it rigid. The outside diameter is no greater than 4’ as to maximize use of 8’ 2X4’s. Each post is resting on its own pad made from cheap patio stones on level ground. Each wall is constructed of 2X4 pine (most of which came from the 70% off bin at Home Depot). No wall is longer or higher than 4’ to make efficient use of 8’ 2X4’s and sheeting. The front wall contains the entryway and cleanout tray access. The left side wall contains the chicken door entryway. 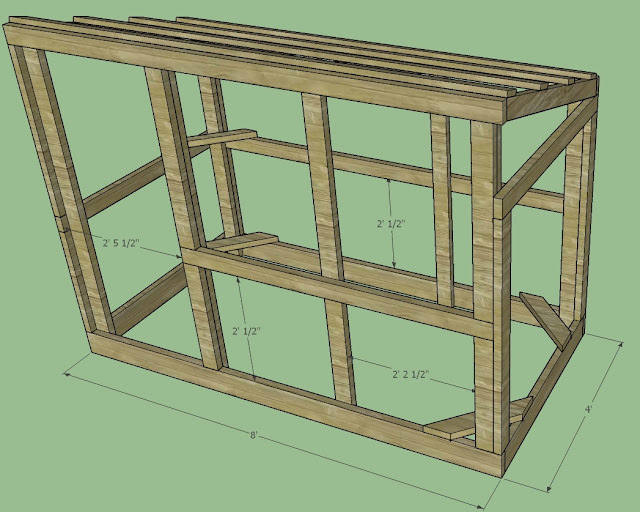 The right side is where the nesting boxes will be attached. 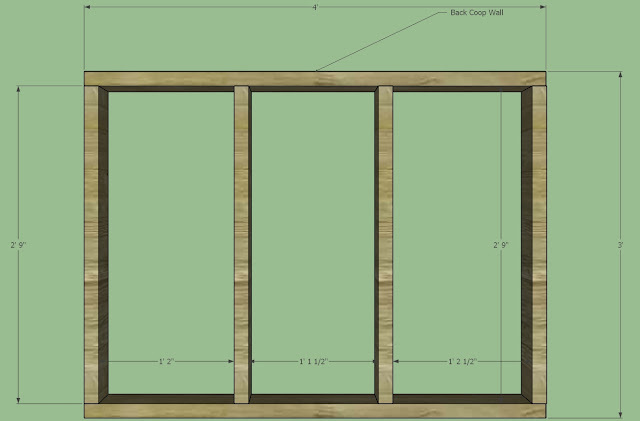 Below are the details on all four walls. 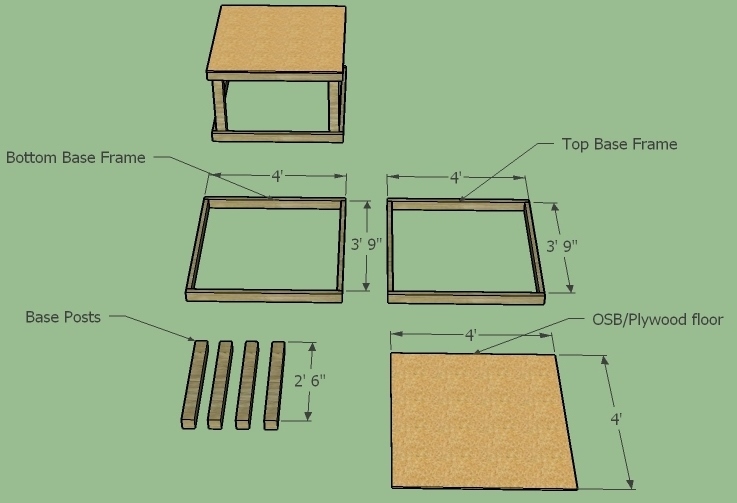 OSB dividers were added to separate the box into the three nesting areas. The lid is made of OSB as well and is just slightly oversized as to create a small over hang when closed. I used a standard gate latch to secure the lid and a piece of scrap as a kickstand to hold it open while eggs are collected. 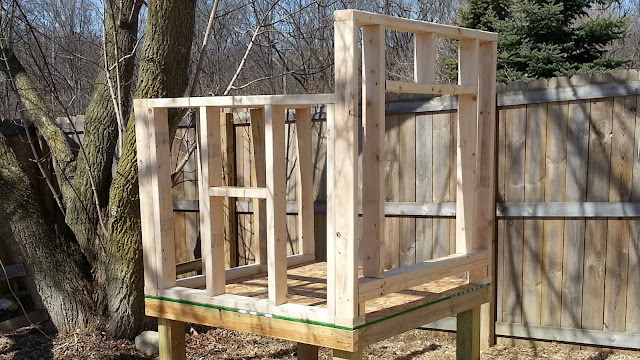 Cut the top two diagonal supports once the box is mounted to the coop. 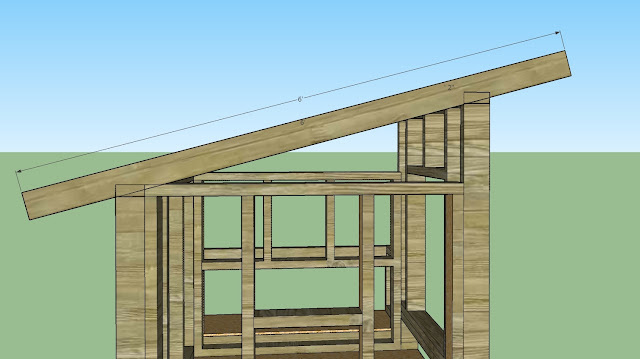 The roof is fairly simple, 4 2X4 trusses spanning from front to back. Each truss is notched out to rest on the front and back walls. 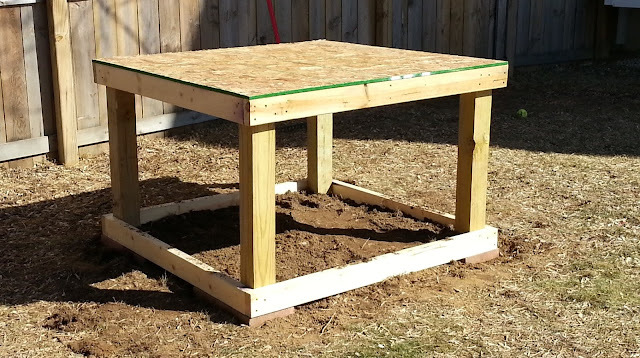 The top is covered with OSB with as much over hang as you would like. The roofing is made of corrugated roof panels to fit over the OSB roof. There are special nails that go with the roofing panels and foam caps to close of the rigged ends as well. The cleanout tray is one of the best features of this design. The tray slides in and out along the floor of the coop through a small access door under the main access. The tray is made of scrap 2X4 cut into 1.5” strips and some OSB. I used deck stain to seal the wood and protect it and some cheap stick on linoleum tiles on the inside of the tray. 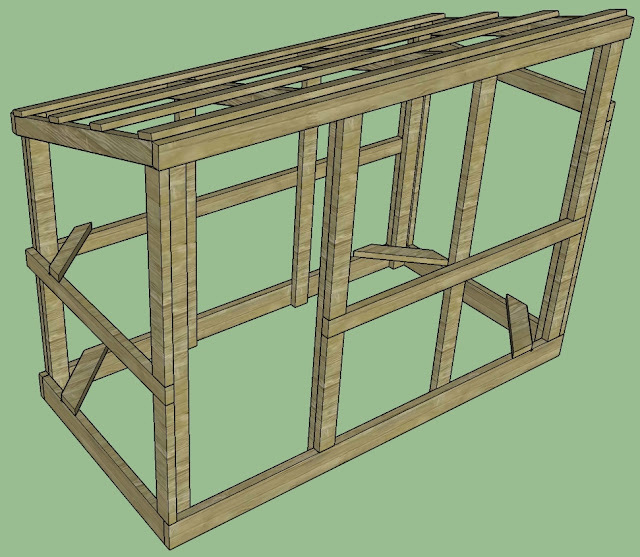 Once the core of the coop is built the outside can be covered with whatever material you choose. I used a cheap paneling I found at Home Depot and then stained it with deck stain to protect it. You can also use plywood, pallet wood, or any other material to cover the coop. I cut in the access door and cleanout tray door with a jig saw once the paneling was secured. I also later cut a small window above the nesting box and made a simple flap opening with an old hinge. 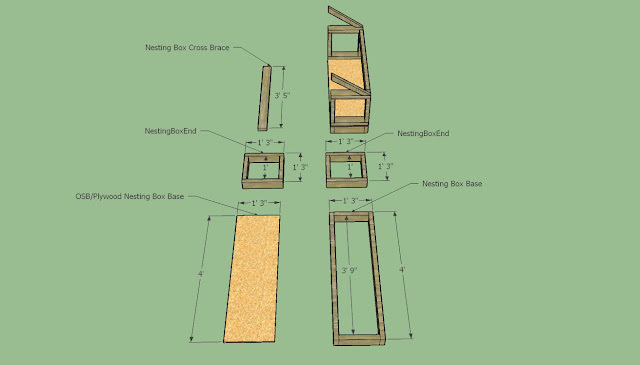 You can use any hinges and door latches that you choose for the main door, nesting box access, and cleanout access. Now, on to the chicken run! The chicken run gives our little egg producers some nice space to hang out during the day with plenty of cover for rainy days. I have converted this into a mobile chicken tractor as well so I can keep them contained and let them get fresh scratching ground. That is not covered in these plans but if you would like more info check out the YouTube video series here. Remember, this is a general guide with the style that I chose but don’t be afraid to change anything you want along the way! For the full video walkthrough please check out the video here. 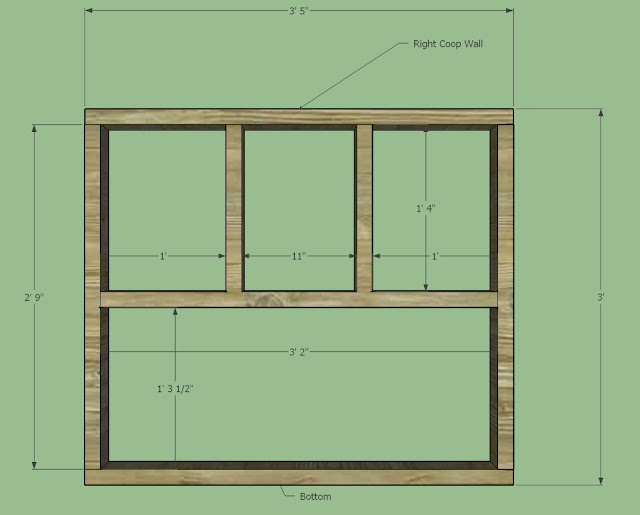 The run starts with a 2X6 frame that is an 8’X4’ rectangle secured with deck screws. Next the 5’ and 6’ wall supports are installed vertically from the base frame. Supports are attached around the middle perimeter of the walls. The full cut list with dimensions is below. Three of the base corners get a diagonal support brace and one on the perimeter supports as well. 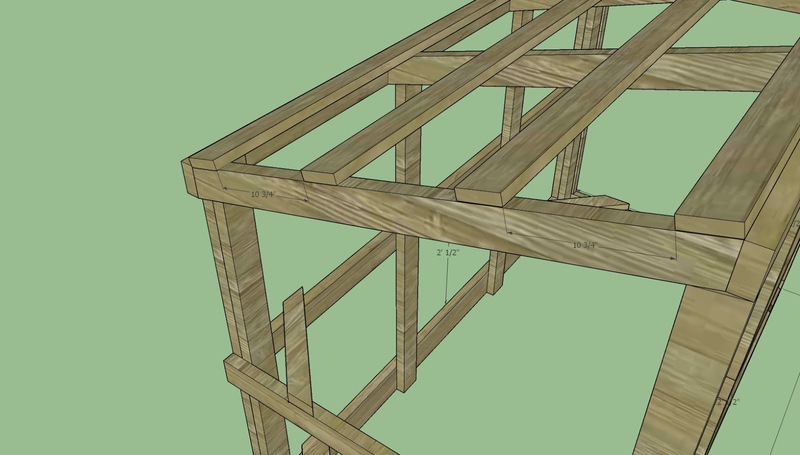 The top of each wall also gets a horizontal support the overhangs on each end to later support the trusses. Trusses are installed in-between the top horizontal wall supports and topped with 1X4 runners. These runners are there purely to give something for the Ondura roofing to attach to. 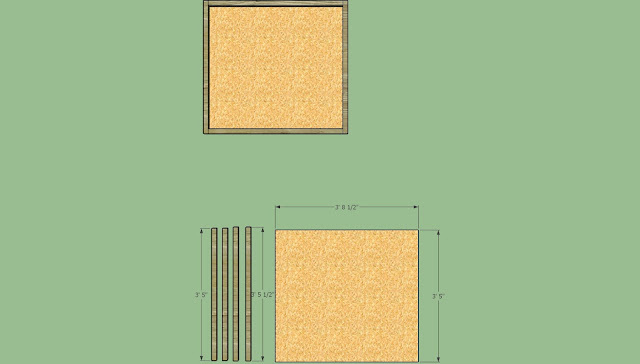 The above materials were used to flush the walls for attaching the hardware cloth and are not needed if you intend to use chicken wire instead. Although some may be needed to provide a mounting locating for the door. 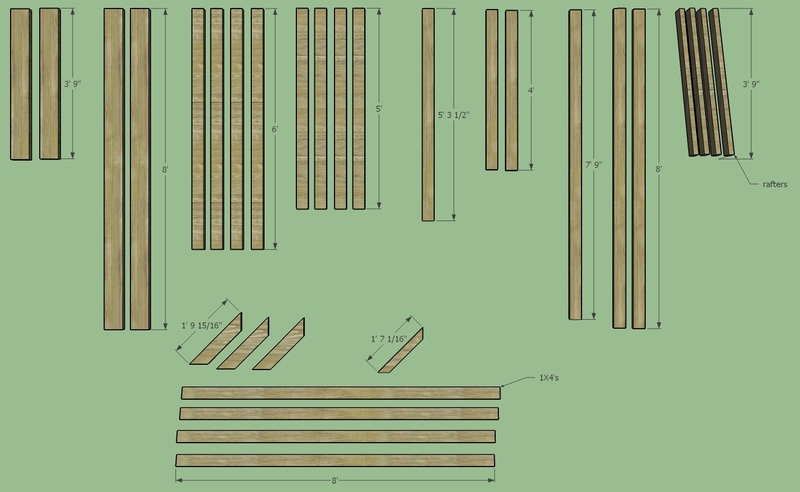 These “filler” studs go between the base and side horizontal support to allow the hardware cloth a flat place to be stapled without leaving gaps. They also run from the top wall horizontal support to the middle support as well on each corner of the run. 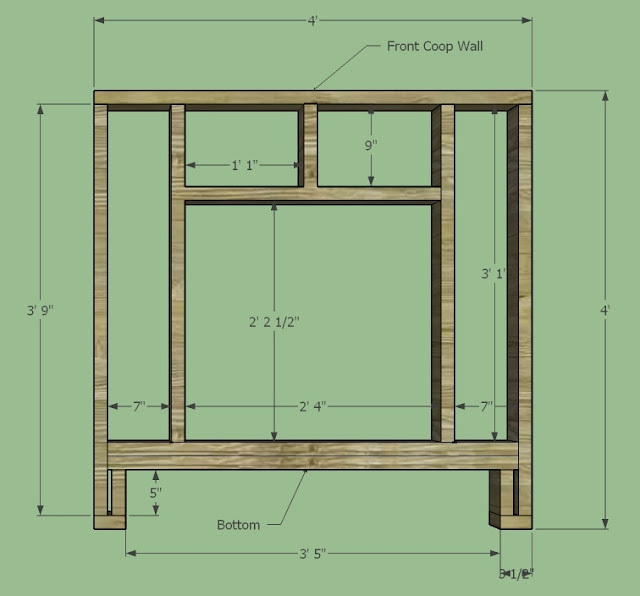 The coop door is made of 2X4 studs with a cheap version of a pocket hole connecting the corner braces together. You can toenail these or angle screw them together as well. The pocket hole I used is detailed in the video. The door can be covered with chicken wire or hardware cloth using a staple gun. - Cheap stick on vinyl tiles to cover inside of tray. - Flashing for nesting box lid (where the hinges are). I used a piece of 4”X4’ vinyl cut from a pool toy and some construction adhesive. This ensures water does not leak between the coop wall and the nesting box lid. - Hardware cloth or chicken wire. Chicken wire is much cheaper but doesn’t look as nice and it a bit flimsy. Hardware cloth is rather expensive but tougher and lays flatter. & share pictures of your coop! I saw your comment after I erected the first two walls and I proceeded carefully. I followed the instructions step by step and I did NOT have the problem you described. Mine came out perfect. (except my occasional novice error) I would have liked more details on the nesting boxes, but hay, these designs were free. THANKS SSL DAD for taking the time to share all this info ! I'm getting ready to build my coop very soon and loved your design. I'm a carpenter so I'll probably make a few minor changes, but it looks great and seems to function well. My concern is predators, particularly, the ground kind. We live near Detroit so large predators aren't much of a concern, but rats seem to be the main concern. 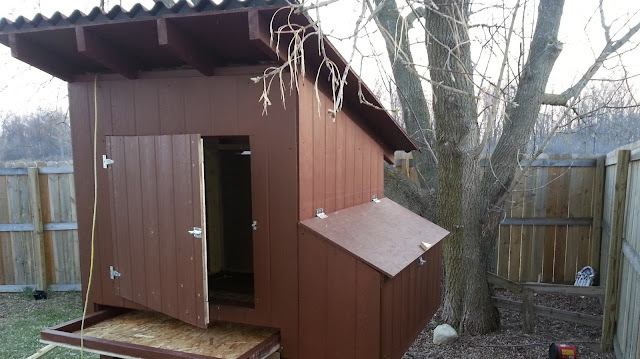 So instead of making the run removable, I think we'll fix it to the coop. Have you had any issues with your coop in high winds? I'm in the process of building. Was wanting to attach my run as well for the same reasons. Was curious as to how that went. 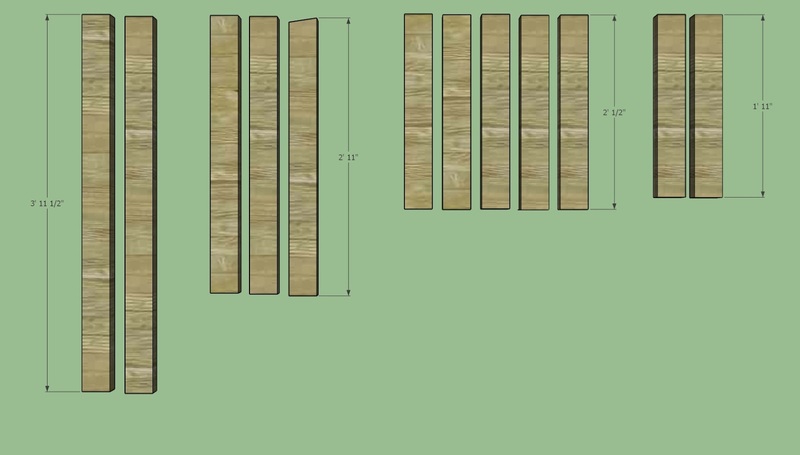 thank you for making these plans available, i'm planning on starting our own chickens next year after we sort out the back yard and I build this coop. It's just the size I was looking for. Thanks again, God bless. Can anyone tell me the approximate cost of the materials to build this coop and run. I was curious as to the approximate cost of materials, as well. There are a lot of factors here that you can change to make it more or less expensive but with the hardware cloth being used and the watering and feeding system we spent between $400-$500 dollars. 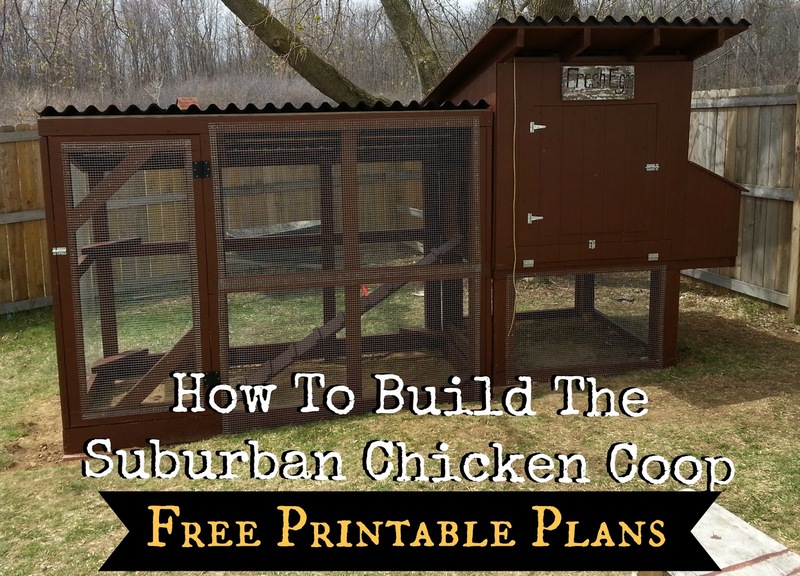 I just started building my coop and run using these plans and so far so good! I cannot wait to see the finished product. Thank you so much for providing these plans to the public! They are wonderful and easy to follow for a beginner like myself. I am curious, do you have roosting spots inside of the main coop or is it just a flat area for them to sit? I am thinking of adding some long pieces of wood to make a roosting spot but wasn't sure if this was necessary or not. DO NOT use chicken wires. EVERYTHING LOVES CHICKENS AND DUCKS. Rats, raccoons, opossums, weasles, foxes, coyotes, you name it, can easily chew through, climb over, or dig under to get an easy meal. Lost my whole flock in one night, pets and all because of chicken wire(sounds like something your are suppose to be used for chickens, right? WRONG! )Found a couple of chicken with their leg and necks pulled thru the wire and chewed off. And I won't start to tell you about the baby chicks. So Sad. They had counted on me to keep them safe. Now, not only hardware cloth covering EVERYTHING, our yard dog stays in the run at nights. so true, so many people don't realise the risks of using chicken wire. It is great for growing plants on, and that is about it. I live in metro Australia and we still get foxes in the city, pulling wire apart! Can you post picks of where the perches go? Where do they sleep? Ive nearly got mine finished. Thank you so much. 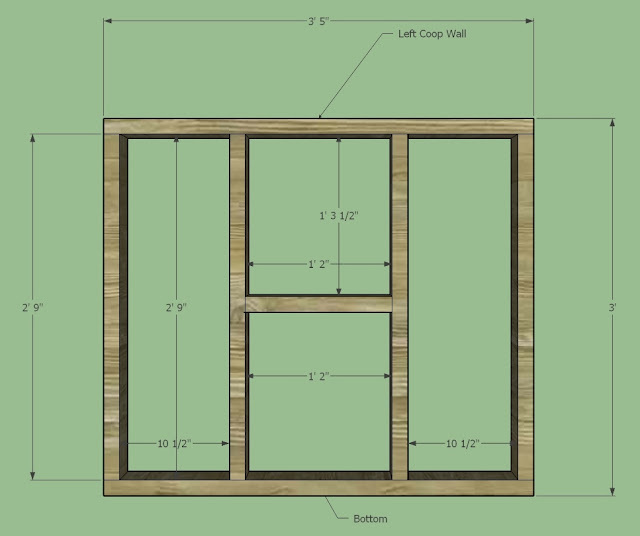 Selecting the right chicken coop designs is the most important part of building your chicken coop. The right designs can save you hundreds of dollars in mistakes and make the experience much more enjoyable. Don't begin your project without first reading this diy chicken coop plans report.